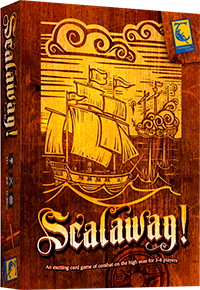 Universal Head recently worked on a new game project which has just hit Kickstarter: a card game of conflict on the high seas for 3-8 players called Scalawag! It was a pleasure working with Steve Nix of Troubadour Games; and with the evocative scratchboard artwork of illustrator Jeffrey Thompson. One of the refreshing things about this particular graphic design project for Universal Head was Steve’s clear vision of simplicity. Unlike many games these days, Scalawag! has an uncluttered look that makes you feel like you’re playing with a deck of Age of Sail-period cards rather than a deck of game cards covered with descriptive text and icons. Now that the game is ready for production and the campaign has begun, Steve took the time to answer a few prying questions about this first design for his new game company Troubadour Games, his own game preferences, and his goals for the company. Final Tally: 567 backers, $23,642 raised. EOG: What came first when you designed Scalawag!, the mechanics or the theme? Nix: When founding Troubadour Games, the goal for the company was to develop games rich in theme that allowed players to tell their own stories through play. Good themes would provide an environment where the mechanics support the game world naturally, making the game easier to learn because a player’s available actions ‘just make sense’. With that in mind, a handful of themes became forerunners for the choice of Troubadour Game’s debut title. On the production side, it made sense that the first title should be easy to demo at conventions (or in Kickstarter videos), appeal to a broad audience, and not be too aggressive on the component side. The production needs therefore suited a quick and casual card game. The thematic needs required a game world that most people have at least a romanticized knowledge of and appreciation for. Those considerations quickly led to the creation of Scalawag! ; selecting the Age of Sail theme to partner with card game mechanics that I felt complemented the subject matter. The short summary to that long answer is that the production needs influenced the mechanics, which then required selecting the right theme partner from among those previously chosen as forerunners. A bit of a ‘chicken or the egg’ situation in truth, but I guess I’d say mechanics edged out and technically came first. EOG: Is the Age of Sail a period you’re particularly interested in? Did you approach the theme from a historical perspective or a literary one? Nix: Perhaps unsurprisingly, my fondness for the Age of Sail period actually came from a game. Sid Meier’s original Pirates! on the Apple IIGS is one of my favorite games of all time. It delivered a true open world experience and perfectly blended the feeling of historical fact with the romantic adventure of sailing the high seas! His game delivered what I often call a ‘want to do experience’; I wanted to be the captain of my own ship and sail wherever I pleased. EOG: What kind of games do you enjoy? If so, any favorites and why? Were any a particular influence on the development of Scalawag!? Some favorites would include: Most RPGs, A Game of Thrones: The Board Game, Hammer of the Scots, Ascending Empires, the idea of Zombicide (with mechanic tweaks), and Descent 2nd Edition. Games that influenced Scalawag! are Bang!, Coup, and Citadels. Of note perhaps is that while none of those were my top favorites in their entirety, each offered something I found very interesting that I thought would add to the experience of being a ship’s captain in Scalawag! EOG: Any new mechanics/innovations that you’re particularly proud of in this game? Why? Nix: I am very happy with the social mechanic of fluid alliances that occurs within the game (even during Allegiance Play where partnerships are predetermined). The adjacency mechanics are put to good use here as your adjacent players are your default ‘opponents’ and the players next to them are your default ‘allies’, at least until your opponent is sunk. The desire to sink your opponent and claim a Prize of War is weighed against how well your temporary allies are holding up. Shifting alliances to maintain a level playing field among all players isn’t always easy to manage, but I think it really delivers on the fiction of a chaotic naval battle where the ships are constantly in motion; attempting to gain position on each other. EOG: There seems to be a lot of shouting of “Scalawag!” during the game, or the potential for it. How does this work during actual play? Do players use the bluffing mechanic a lot, and do other players call on their bluff a lot? Tell us more about this interesting mechanic. 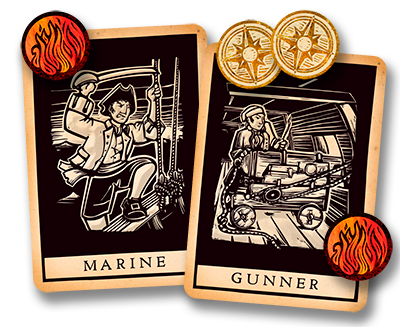 Nix: Players have several Captain’s Orders at their disposal that do not require any bluffing, but are enhanced when declaring Crew Cards that support the order (Crew Cards that they might not have). In this way, a player’s own comfort with bluffing can be managed. Due to the Crew Card distribution, some bluffs are designed to be easier. Declaring a single Sailor to support the Trim Sails order is a fairly safe bluff (several Sailors are available and its gain of one additional Compass Point isn’t necessarily game changing). Declaring two Sailors is a bit riskier; about on par with declaring a single Pilot, Mutineer, or Lookout (required for more potent orders). Declaring three Sailors takes some real nerves of steel if you are bluffing, but provides such a valuable return that it just might be worth the risk. Bluffing was designed to be a way to gain an edge in the game, but a player is not required to bluff to win. The amount of bluffing (and a similar amount of “Scalawag!” calls) is really determined by the personalities of the players in that particular game. EOG: Scalawag! has quite an interesting set of rules but uses a very simple set of components. Was this a conscious design decision? Nix: Yes, absolutely. While the production needs of the company influenced the component choices, I have also developed a personal design mindset that wants to trim away at mechanics and components until only what is vital to the experience remains. I am a huge fan of great components in a game, but not when they aren’t truly adding to the experience. I think some games can go a bit overboard with the bits, becoming clutter that isn’t adding enough value for their addition. EOG: Tell us about your approach to the visual design of the game. What were your influences and preferences (other games, history, other objects, art, etc)? Nix: I wanted to deliver a visual look that immediately took the player into the game’s world. From first looking at the box cover to viewing their cards, I was looking for a style that felt completely natural to the setting; as if the players were playing a round of cards below decks aboard a mighty warship. The woodcut art style that was popular during that historical period seemed a perfect match, especially when I discovered Jeffrey Thompson’s unique slant on it. Vintage playing card and tarot deck artistry also influenced the minimalist approach to the card design. EOG: Why the Kickstarter route? Will future Troubadour games be Kickstarter funded? Your opinion on Kickstarter in general? Nix: As a new publisher with its first game, Kickstarter allows me to interact with a potential fan base in a way that really isn’t possible otherwise. I don’t truly know how much demand there is until I start communicating with the players, meanwhile the players wouldn’t know where to find me to communicate their enthusiasm without the Kickstarter platform. Once Troubadour Games has gained an audience and they know ‘where to find me’, a discussion about future titles can be more of an ongoing process. Kickstarter becomes more of an option at that point, instead of a necessity. I think Kickstarter is a great platform when used appropriately. The ease in which a project can be launched may lead a potential creator into making the leap before they have truly crafted a solid plan of execution. Kickstarter provides a great environment to reach an audience, but it is the creator’s responsibility to come to the table with quality work. EOG: What do you think is special about this game that will induce gamers to part with their cash? Nix: The art will draw players into a game world that delivers a great ‘want to do experience’; being the captain of your own ship during the Age of Sail. The game’s components and mechanics deliver the best parts of that fantasy, maximizing the fun within a short play time. I believe these qualities can be seen within the brief tutorial video presentation of Scalawag! on its Kickstarter project page, which will hopefully instill trust in the game players out there to back the project. EOG: Any plans for the future you can tease readers with? What’s next for Troubadour Games? Nix: I have the next game in early development. It’s a bit too early to discuss what it is, but if all goes well with Scalawag! I can say I will have the freedom to be more ambitious in its design scope. I am very excited by its potential! Thanks for telling the EOG about your new game Steve, and best of luck with its launch onto the high seas! Check out the Kickstarter campaign for more information.